If you are a car dealer or automobile constructor I am sure our Car Dealer Script will be helpful for you. Our Open Source Car dealer script is user friendly, fully functional and easy to use and SEO friendly. This is the best choice for starting an Entrepreneur car portal website and you can generate more revenue from our Car dealer script. Why You Should Choose our Car Dealer Script? 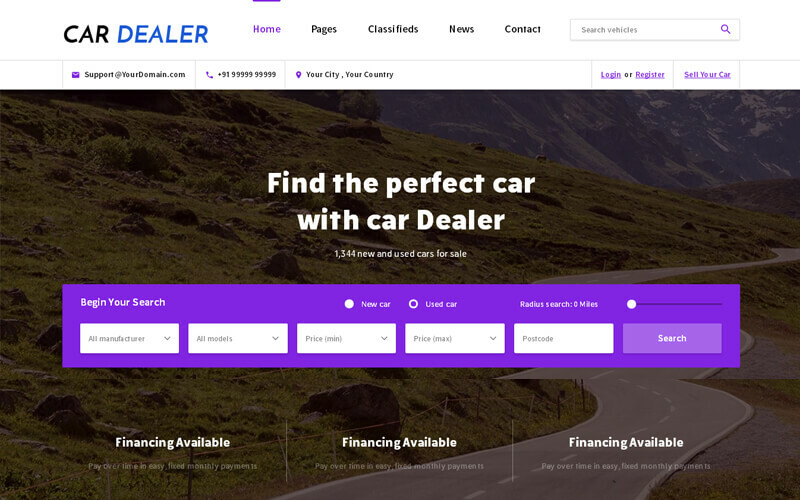 Are you looking for an Readymade Car Dealer Script website, need not worry, we have developed world’s no: 1 CMS Word Press theme for Auto Dealer. Word Press Theme is used to maintain responsible design, multi language support and large database. If I could select more reasons for my rating it would not only be this car dealer script, but it would be a customer support, Code Quality, Flexibility, Documentation Quality (huge amazing documentation with this script, it’s incredible to be honest), customization, Feature Availability. Yes I just named all of the reasons for rating options. This script is purely amazing and customer support is the best. It is an easy way to sell and buy cars via this script. This car dealer script had an all necessary functionalities. I am very much like their support team. They give only good scripts for their customers. This script really helped for my business to improve. I didn’t believe that at first when I buy it. But now it boosts my car sales per day!! !